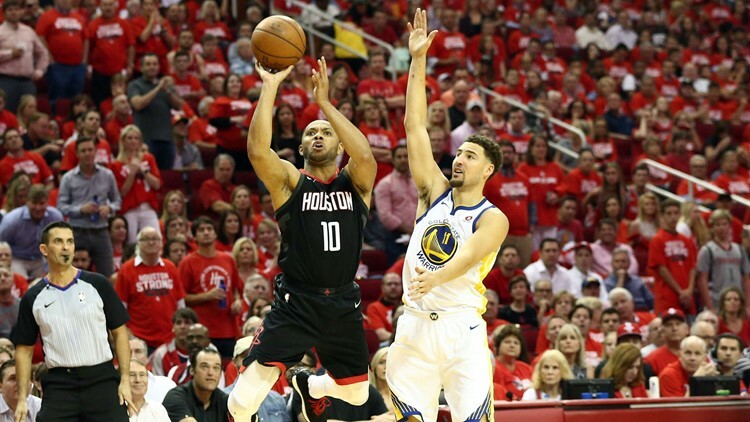 With the best of seven series tied at 3-3, the Houston Rockets and the Golden State Warriors are set to play the final game of their Western Conference Finals in a winner takes all Game 7 at the Toyota Center tomorrow. Whichever team grabs the victory will advance in the NBA Finals to face the Cleveland Cavaliers. The Rockets can surely feel the entire pressure heading into Game 7 following their blowout road loss against Golden State in Game 6 despite of James Harden’s 32 points and nine assists. The team played without injured All-Star point guard Chris Paul due to the right hamstring injury he got during the final minutes of Game 5. Moving forward, Paul has been listed as questionable as he continues to receive treatment. According to coach Mike D’Antoni, the 33-year-old veteran guard will likely be a game-time decision for the upcoming game. After being trailed by as many as 17 points in Game 6, the Warriors have showed their championship spirit as they pulled off a 115-86 victory against the Rockets as they tied the series to three games apiece. Thanks to the phenomenal shooting performance from the Splash Brothers. Klay Thompson came up huge and was sensational with his game-high 35 points, including his nine threes from beyond the arc while Stephen Curry scored 29 points and five threes as well. Kevin Durant added 23 points. Meanwhile, Andre Iguodala and Kevon Looney are questionable for Game 7. Looking for the best odds? Check it below!